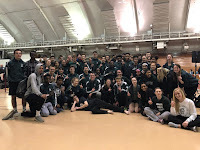 The boys and girls track and field teams headed to Watertown High School Friday night for our first outdoor varsity invitational. The weather was a bit dicey at the beginning with cloud cover and high winds but the bad weather blew threw early, the sun came out, and the wind calmed down for a seasonable night. It was quite evident Friday night that the varsity kids have been working hard in practice and at the duals as we competed very well in our invitational. It was great to see multiple athletes PRing and every kid competing for their places in every event. We learned a lot about our team Friday night and feel good going into the remainder of our outdoor schedule about our potential for the season. It will be important that every athlete contributes towards our season goals so that we can meet our utmost potential. Keep pushing each other in practice and being ready for meets. The performer of the meet goes to Daurice F as he won both hurdle races running 15.05 in the 110 hurdles (Spartan Seven #6 perfomance) and 40.81 in the 300 hurdles both performances putting Daurice on the state honor roll. Additionally, Daurice added a 3rd place finish in the long jump with a leap of 19' 3". The only other event winner was Corinne F in the discus with a toss of 131' 6" and she added a 3rd in the shot put at 32' 11.5". Scorers for the girls were McKenna G 4th in the 100 dash in 12.96, Marissa H 5th in the 200 dash in 27.52, Hannah L 5th in the 400 dash in 1:02.39, Mariah OF 6th in the 300 hurdles in 52.62, Jessi Ford 4th in the discus with a toss of 100' 10" and 4th in the shot put at 31' 6.75", Anna H 2nd in the high jump with a leap of 4' 10", Marissa H 5th in the high jump with a leap of 4' 8", Natalie S. 8th in the pole vault with a performance of 6' 6" and Kayley A. 7th in the triple jump with a jump of 30' 11.5". The girls finished in 4th place with 67.5 points. Scorers on the boys side include Alex K. 6th in the 200 dash running 24.28, Robbie E 6th in the 400 dash in 55.09, Ben A 3rd in the 800 run in 2:01.19, Jordan B. 6th in the 1600 run in 4:44.84, Jonah W. 4th in the 3200 run in 10:02.85, Rob S. 3rd in the discus in 125' 5" and 4th in the shot put with a throw of 42' 9.25", Ryan B in 8th in the discus with a toss of 115' 6", and Blake T-J 4th in the pole vault 12' 0". The boys finished in 4th place with 79 points. Girls State Honor Roll - Corinne F 143' 8"
Who else can join these athletes on the state honor roll?? ?